Homage to Mañjuśrī, the youthful! Devotion fills my body, speech and mind. Each one bowing in prostration to all the buddhas. Completely the entire space of reality. And praise all those who have gone to perfect bliss. The brightest lamps and finest incense. I prostrate and offer to all you victorious ones. Before you, I confess and purify each and every one. And every living being, throughout the entire universe. Turn the unsurpassable wheel of Dharma. And bring well-being and happiness to all living beings. I dedicate to the enlightenment of all beings! And all who now dwell throughout the ten directions of this universe! And attain the stages of enlightenment and buddhahood! Around them all their bodhisattva sons and daughters! Live always and forever in happiness and health! That befits them best! And so may all they hope for be fulfilled! May I always renounce the worldly life! Never lapsing, and always free from fault! I shall proclaim the Dharma in the language of all! Be completely purified, every single one! Or sun and moon that course unhindered through the sky. And work for the ultimate benefit of each and every one! And continue this, throughout all the aeons to come! May our actions and aspirations always be one! Never will I disappoint them! And around them all their bodhisattva sons and daughters. May the offerings I make them be endless and vast! And practise these in every age to come! Of skill and discernment, samādhi and liberation! Encircled by all their bodhisattva heirs. Along with them, may I perform the actions of enlightenment! And throughout an ocean of aeons, may I enter into enlightened action in each and every one! May I always be engaged with the speech of the buddhas! As they turn the wheels of Dharma! All that will ever be, in past, present and future! The buddhas of past, present and future! Through the power of liberation, where all is realized as like an illusion! In each atom, and in each and every direction. May I be always in their presence! May I perfectly accomplish the power of enlightenment! And perfect the power of Good Actions! And perform these, without ever growing weary, through oceans of aeons! May I fulfil them all completely! I dedicate fully all these merits! In his skill in good dedication! I shall perfectly fulfil every one of his aims! Let my bodhisattva acts be beyond measure! Let my enlightened qualities be measureless too! May I accomplish all the miraculous powers of enlightenment! Be as limitless as their karma and harmful emotions! For as many aeons as there are atoms in those realms. Soon behold the Buddha of Boundless Light. They will become just like Samantabhadra. If they recite this Aspiration to Good Actions. Be born in a good family, and with a radiant appearance. And all three worlds will honour them with offerings. And tame Māra with all his hordes. Have no doubt: supreme enlightenment will be yours! To train and follow in their footsteps. For all beings to perfect Good Actions. And go at once to his pure land of Sukhāvatī. And bring help to beings for as long as the universe remains! Grant me the prophecy foretelling my enlightenment! May I bring enormous benefit to sentient beings, in all the ten directions! Reach the supreme realm of Amitābha! May they perfect what is described in this holy prayer, uttered by Samantabhadra! May the lower realms be entirely emptied! May all the aspirations and dedication prayers be fulfilled! This provisional English version is based on the translations by: Tulku Thondup Rinpoche and Harold Talbott, Professor R.A.F. 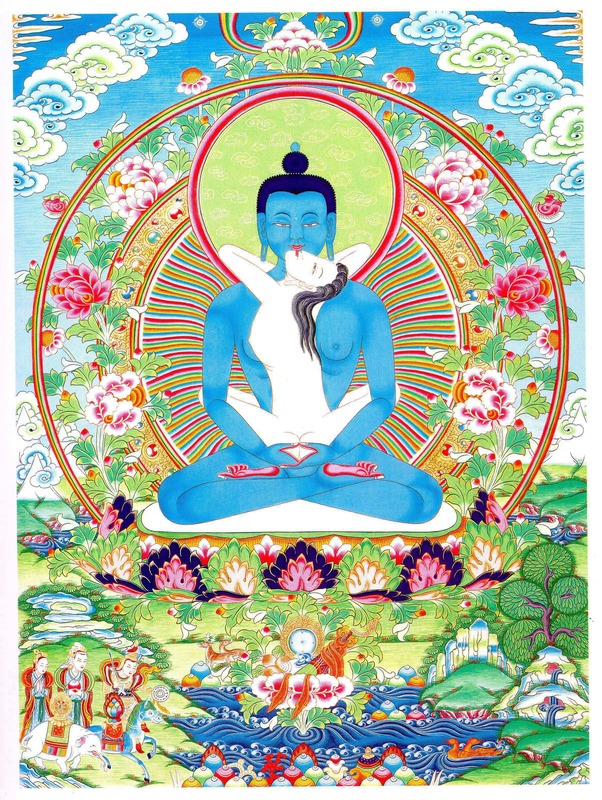 Thurman, and Elizabeth Callahan and Khenpo Tsultrim Gyatso. The last two verses Translation from Essential Prayers related to the Guru Yoga Practice according to the Seven Line Prayer.